Total Comfort Mechanical is committed to the responsibility we all share in caring for the environment. Recycling not only saves energy, water and valuable resources such as trees and metal, but it also reduces pollution and creates industry and jobs. 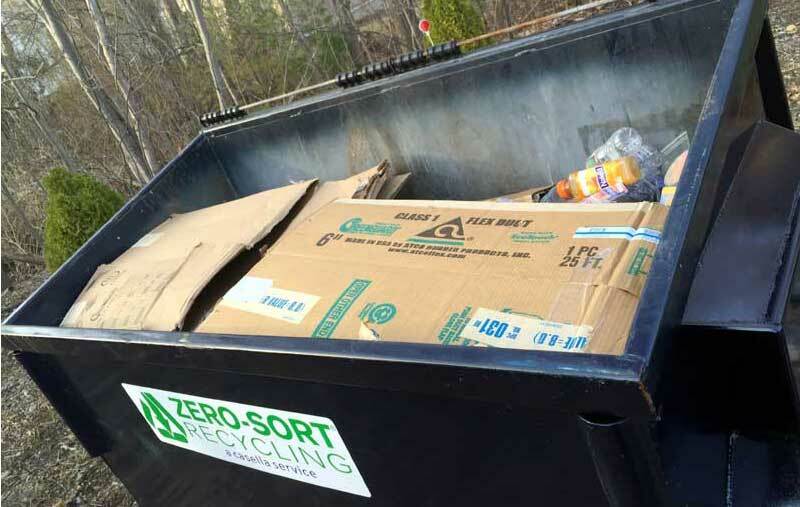 Our recycle dumpster in Burlington is filled every week with the two yards of paper and plastic that is collected from new equipment packaging and other waste. When removing your old equipment, our EPA-certified technicians safely remove and handle hazardous refrigerant following all safety procedures to prevent leaks into the atmosphere and ground. Out of service equipment is dismantled and we ensure that all metals are recycled. Recycling at home is one of the easiest ways to do something good for the environment. 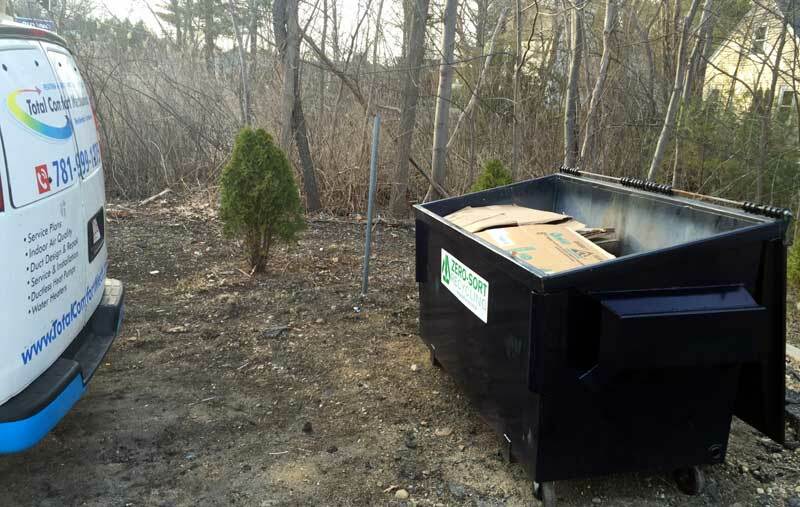 Nearly all Massachusetts cities and towns offer residents recycling opportunities. To learn more about recycling and hazardous household product management programs in or near your community, visit Energy & Environmental Affairs at Mass.gov to find the alphabetical listings by city. With over 13 years of experience, we serve the Massachusetts cities of Burlington, Bedford, Billerica, Lexington, Wilmington, Winchester, Woburn and surrounding New England areas in Middlesex County, MA. As community members and a family-owned business, we put the highest priority on respecting the needs and concerns of the people around us and caring for the environment. We treat our customers and their homes with respect and make sure we leave our job site even cleaner than it was before we started to work. From our first meeting to the end of your project, we pledge to serve all your heating and cooling needs while exceeding your expectations. Our combination of experience, knowledge, and ability to provide quality craftsmanship are second to none. Visit www.totalcomfortmech.com for more information. 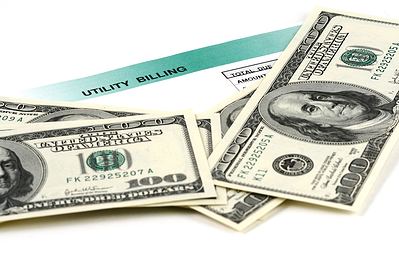 Are high utility bills getting you down this summer? Keeping your Massachusetts home air-conditioned and comfortable can be expensive. Everyone's trying to beat the sweltering July and August heat and energy consumption is high. The good news is there are actually some very simple things you can do to keep costs down without investing a fortune. Some people believe that keeping a ceiling fan running all the time, even when the room is unoccupied, will keep the room cooler than if turned off. While they do help circulate air, ceiling fans have no effect on the temperature of the area. They simply redistribute already conditioned (or unconditioned) air and make it feel cooler because it's creating a breeze against your body. Leaving the fan on while the room is empty will not make the room any cooler upon your return. Turn them off when leaving a room to prevent wasted electricity. We're talking actual green in color - whatever shades appeal to you : forest green, emerald green, moss or fir. Adding more trees and bushes to your home's exterior not only provides a more beautiful landscape, but can considerably block the amount of solar heat beaming on the roof and through the windows. All that heat makes your air conditioning system work harder. In addition, if the air conditioning unit itself receives shading from trees or shrubbery, it can improve your AC's effectiveness up to ten percent! Massachusetts lies in the "temperate" area on the US Dept. of Energy's climate region map. Unlike the hot and arid Southwest and hot and humid Southeast, energy-saving landscaping strategies for this area must be balanced - keeping heat out in summer and keeping it in during winter months (see more at Landscape for Life). If your home has a basement, why not convert it into a summer family room or hangout? Naturally cooler than the rest of the home, the basement can provide instant relief on a hot day. Be careful about opening basement windows though, especially during very hot and humid weather. Damp, tropical air can cause surface condensation which will increase indoor humidity as well. To be absolutely certain you are obtaining optimal efficiency from your home's A/C system, schedule a system maintenance check with us. We will check multiple factors to ensure all air conditioning system components are operating properly, that the system is meeting the manufacturer’s expectations for efficiency, and recommend alternatives if not. Our customers and subscribers have asked for suggestions on how to reduce the energy costs associated with home cooling during the summer months. To help, we’ve compiled this list for easy reference, and to easily share with friends and family, too! Looking for ways to beat the heat? July has been a scorcher in Burlington, and neighboring Massachusetts areas it looks like August will bring more of the same. Replace filters regularly! This is one of the easiest things to do yet one of the most commonly overlooked. Filters should be replaced monthly, so make it a habit by keeping a supply of filters on hand. Set your thermostat and leave it. Pick a temperature that you are comfortable with (perhaps 75°) and keep it at a constant setting. Turning the thermostat down doesn’t affect the temperature of the air blowing out of your vents. It makes the system run longer, not colder. Keep curtains, drapes and blinds closed, especially on the west-facing side of your house. Shade your air conditioner. Your unit works harder if it is in an area that receives full sun. Don’t block the AC unit. Keep air flow free from obstructions. Keep household appliances that produce heat far away from your thermostat. You don’t want an adjacent TV or water heater to contribute to a false thermostat temperature. Caulk around window frames to seal any leaks and check weather stripping. Invest in a few good ceiling fans or some smaller portable fans. Fans provide evaporative cooling as you sweat. If you buy a ceiling fan with lights, opt for those with Compact Fluorescent Lamps (pin-type) CFL’s, which last up to 15 times as long as incandescent bulbs. If your home has a fireplace, don’t send cool air up the chimney – close the damper and shut glass doors. Schedule regular service on your air conditioning system. Your system’s refrigerant charge needs to be checked annually, and the AC unit needs to be cleaned professionally. A/C Maintenance ensures your system is running at peak efficiency. If you are concerned about obtaining optimal efficiency from your Air Conditioning system, be sure to schedule an A/C system maintenance check with your HVAC contractor. A professional will check multiple factors to ensure all air conditioning system components are operating properly, and that the system is meeting the manufacturer’s expectations for efficiency.